The comedies I like usually fall into one of two categories. The first group features movies that are initially very funny, but end up losing some of their luster upon repeat viewings as jokes grow stale and outdated. The second, however, is made up of movies that somehow remain just as funny no matter how many times I see them. Hell, sometimes they even manage to become funnier as more nuances in the writing and performances start to reveal themselves. Mike Nichols' 'The Birdcage' easily falls under that rare second category. I've seen the film countless times over the years, and yet it never seems to get old. Despite knowing every quotable line and silly gag, I still laugh non-stop. A playful celebration of diversity and a gradually escalating excursion into awkward hilarity, the movie is an infinitely rewatchable comedy of errors… and yes, "that's just what Rush Limbaugh said!" Based on the French film, 'La Cage aux Folles,' the story focuses on Armand Goldman (or is it Coldman? ), the gay owner of a drag-queen nightclub in South Beach. When his son, Val (Dan Futterman), reveals that he is getting married, Arman is tasked with the duty of hosting a dinner party for his future daughter in law's family. Unfortunately, her father happens to be a conservative senator (Gene Hackman), and Val is worried that his dad's lifestyle will shock the politician. In order to avoid scaring them away, Armand and his overly dramatic partner, Albert (Nathan Lane), agree to pretend to be heterosexual… and gentile. But once the dinner commences, a series of mishaps quickly begin to unravel their ruse, putting Val's future wedding in jeopardy. A great sense of timing and chemistry are essential components of any successful ensemble comedy, and the actors of 'The Birdcage' demonstrates both of these qualities in spades. 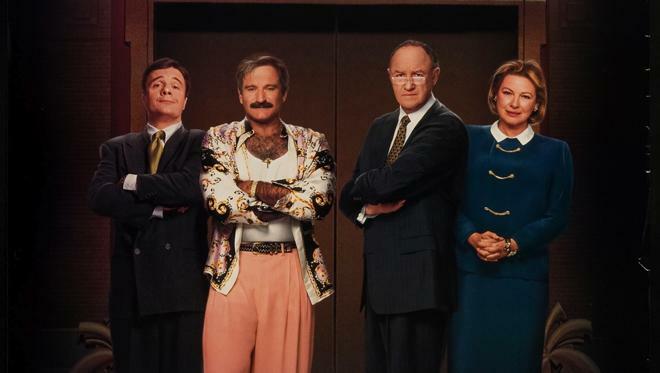 Brilliantly cast against type, Robin Williams actually takes on the (comparatively) straight man role against Nathan Lane's overtly flamboyant character. Together, the pair make for a hilarious couple and their bickering is both amusing and endearing. As Armand, Williams offers a carefully honed in performance, sneaking in perfectly timed sarcastic jabs along with just a few dashes of his trademark manic energy. In contrast, Lane goes all out, milking Albert's drama queen personality for all it's worth -- turning every hysterical outburst into potent comedy. And when Mrs. Coldman (or is it Coleman?) finally shows up, all bets are off. Likewise, as memorable as Williams and Lane are, the real scene stealers here end up being Hank Azaria and, much more surprisingly, the great Gene Hackman. The former is well known for his zany characters (he voices several on 'The Simpsons'), and is perfectly at home in the shoeless feet of Agador (Spartacus!). On the complete opposite end of the comedy spectrum, is Gene Hackman's amusingly grumpy take on Senator Keeley. Through comically dry delivery, the veteran actor turns the dull and oblivious politician into one of the movie's funniest characters. In fact, his "passionate" story about Virginia's amazing foliage remains one of my favorite bits. Much of the movie's humor comes from the juxtaposition of the two families' very different worlds, and from Armand and Albert's ill-fated attempts to hide their real personalities (a bit about trying to walk like John Wayne is priceless). 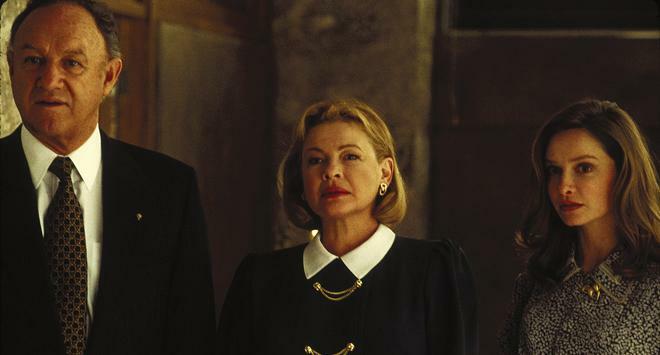 To this end, director Mike Nichols and screenwriter Elaine May play up the culture clashing to hilarious results, slowly building the comedic tension toward the film's gut-busting climax with copious jokes along the way. And in between all the sharp banter and memorable lines, the two tackle some good-natured themes about acceptance, diversity, and family. Of course, while the entire runtime is layered with quotable dialogue and laugh-out-loud moments, the real highlight here is the dinner scene itself. A perfect storm of clever writing, precise direction, and effortless performances, the Goldman dinner party ranks high among cinema's most entertaining on-screen train wrecks. The entire runtime has been leading to this moment, and though we've witnessed the characters carefully plan and rehearse their deception, it all comes crashing down in a sidesplitting testament to Murphy's law ("anything that can go wrong, will go wrong"). And the fact that we've spent so much time watching all of the meticulous preparation only makes the Goldmans' gradual self-destruction that much funnier. 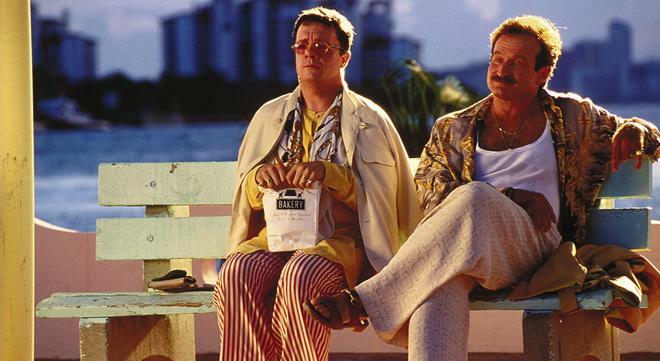 Sure, 'The Birdcage' isn't perfect, and there are some notable flaws here and there. The character of Val comes across as far too unlikeable for most of the runtime, some of the over-the-top gay stereotypes haven't aged particularly well, and many fans of the original French film will likely question whether a remake is necessary at all –- but at the end of the day, the movie never fails to make me laugh… a lot. Armed with hilarious wit, expert comedic direction, and truly memorable performances, this is one of those films that always puts a smile on my face whenever it's on. And unlike its many disposable peers, it will never leave viewers betrayed or bewildered by stale jokes. 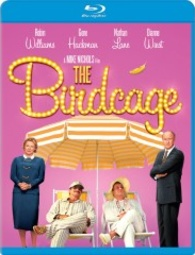 20th Century Fox brings 'The Birdcage' to Blu-ray on a single BD-50 disc that comes housed in a keepcase. After some logos and warnings, the film immediately starts to play, forgoing a traditional menu screen. The packaging indicates that the release is Region A coded. The movie is provided with a 1080p/AVC MPEG-4 transfer in the 1.85:1 aspect ratio. Though seemingly respectful to the modest source (for the most part), this is a decidedly underwhelming image. The source print is in good shape but there are some minor signs of dirt and specks throughout. A very light layer of grain is visible as well, but its appearance can look a tad noisy and unnatural in several instances. Overall detail is noticeably soft and flat with a lack of fine textures (especially in wide shots). Colors are also a little drab and a few indoor scenes look a tad dim. With that said, sequences set in Armand's glitzy nightclub do offer some solid depth and pop. Likewise, contrast is high in several outdoor scenes and the palette emphasizes the South Florida heat with an orange tone. Black levels are well balanced as well. Though most of the picture's lackluster detail is likely inherent to the original photography, there are also aspects about the image that sadly imply the use of an outdated master. The end results are serviceable, but one can't help but feel like this could (and should) have looked better. The film is presented with an English DTS-HD MA 5.1 mix, a Spanish Dolby Digital 2.0 mix, and a French Dolby Digital 5.1 mix, along with English SDH and Spanish subtitles. Frontloaded but solid, the audio gets the job done with a few lively splashes here and there. Speech is clear and well balanced throughout, though it can sound just a bit strained at times. There's a decent sense of directionality between the left and right speakers, spreading appropriate club ambiance (applause, laughter, etc.) throughout the front soundstage. With that said, the modest design work is predominantly frontloaded with little surround activity. Thankfully, the film's score and song selection (headlined by "We are Family") come through with robust fidelity and full separation, offering great range and a solid low end in specific tracks. While there isn't much to the mix, this is a dialogue driven film, and all of the quotable lines are given due emphasis. 'The Birdcage' is an endlessly rewatchable comedy fueled by great performances, strong writing, and nuanced direction. Despite seeing the flick countless times, the jokes never seem to get old. The video transfer is serviceable but a bit underwhelming and seemingly outdated. The audio transfer is basic but still very solid. Unfortunately, the only supplement we get is a trailer. This isn't exactly the top tier release that many fans have been hoping for, but based on the strength of the film itself, this disc is recommended.